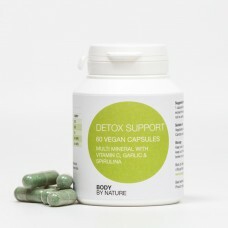 This supplement has been designed as a therapeutic tool, as part of an overall detoxification programme, and thus should not be taken on a prolonged basis daily (or as such with breaks in-between). whilst taking this product to help the elimination systems of the body to aid speedy removal of chelated and conjugated toxins. Ingredients Vitamin C (as ascorbic acid), spirulina, garlic (Allium Sativum), capsule shell (vegetable cellulose), manganese citrate and zinc citrate. Suggested Intake: 1 capsule daily, or take as directed by a practitioner. Contraindications: No known allergic reactions. Non GM & Free From: Wheat; soy, gluten; milk products (lactose); added sugar, colourings; flavourings and preservatives.